This post about Old Navy’s Friends and Family sale contains affiliate links. Please read this blog’s disclosure post for more info. I’ve been very impressed by Old Navy this Spring! My Spring shopping list had some closet staples on it — a few new lightweight dresses, striped tee shirts, and so on. I stopped in Old Navy while scouting some items for a personal shopping client. I was delighted by what I saw! One of the biggest trends you’ll notice this year is color on color. Old Navy has selected some of the prettiest colors to choose from! You’ll fins bright pink, yellow, lilac, a beautiful pale green and light navy blues. All of these colors work wonderfully on their own or together. Basically, Old Navy has made outfit assembly incredibly easy! I mention this because today is the last day of Old Navy’s Friends and Family sale, where you can get 40% off your purchase online only. Use code STYLE at checkout. Certainly, if you feel that your closet is missing cute outfits now is the time to shop! My outfit in this post is a great example. The dress is from Old Navy (I bought it in tall so it hits closer to my knees). 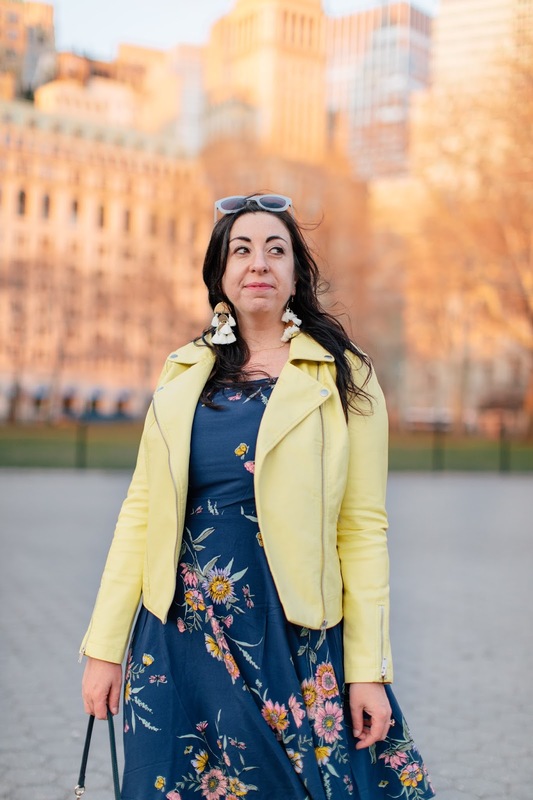 The dress is a brilliant blue and the floral pattern has lilac, pink, green and yellow — all colors that Old Navy happens to make sweaters or jackets in too! Although my jacket is not Old Navy (it’s JustFab but currently sold out, watch for popbacks!) I have two colors of an Old Navy jacket that will also go perfectly with it! This easy mix and max process is why I bought this dress in both the blue floral and the white floral too. First, take a closer look at the dress below to see all the pattern’s colors. Whether it’s blue and yellow like I’m wearing here, green + lilac, pink + black, yellow + pink, green + blue, or some other color combination I haven’t thought to mention here, you’ll find plenty of mix and match options in Old Navy’s Friends and Family sale! Below, my picks from Old Navy’s current assortment. Don’t forget to use code STYLE at checkout for your 40% off discount! I’ll have more Old Navy OOTDs to share in the near future. You can get some more styling ideas in my last Old Navy post. Finally, Anthropologie has added new clothing cuts to its extra 25% off sale! Finally, I’ll have a fresh post about it up tonite; you can check out some picks in my post from the weekend. Previous Post Don’t miss out on the last day of Nordstrom Triple Points weekend! Next Post Anthropologie’s late March sale adds new items! Old Navy seriously has the best finds! I love the dress!! It's so easy to dress up or down. They really do have some of the best stuff right now. Old Navy is one of my go to places for each new season! They always have good staples! Agreed. I bought a bunch of striped tees there too that I'm really excited to wear all Spring and Summer. I just ordered a bunch of dresses from old navy. Excellent! Any one in particular you're really excited about? I love all of these picks! Old Navy dresses are my go-to for the Spring and Summer. And I love some of their blouses for nights out! I need to grab a few of the striped tees! Thanks Laura! The striped tees are pretty much all I wear on the weekends right now. I just started my Spring shopping and Old Navy has some great pieces. I ordered the darling pineapple bikini & can hardly wait to put it in my daughter’s Easter basket this weekend! Also dying for Athleta to offer a F&F discount code! Why don’t they do it when all the other Gap stores do? If you hear about an Athleta code, please let us all know! That makes me so sad! I even have an Athleta card but I didn’t hear anything about it. Oh well. I was told by a girlfriend who works at Athleta that they'll be doing a public promo in April! Sorry I wasn't able to snag a code for the F&F Sara, I tried but my connections were all out. So many cute items! I think I definitely need those bow flats! Those flats are great, and I expect to see the style everywhere this Spring and Summer. Really, bow flats are almost always in. I'm loving all the picks you pulled from Old Navy! 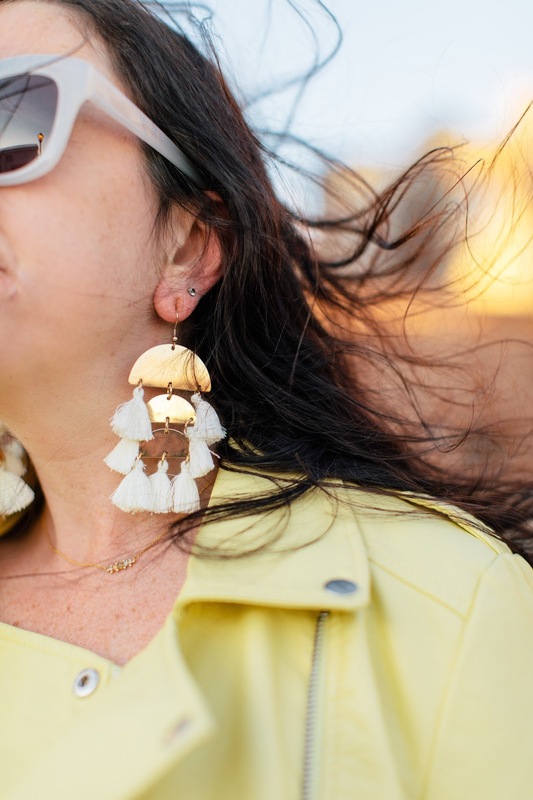 Your dress is so pretty and looks amazing with your yellow moto jacket and earrings! Love everything about this look! 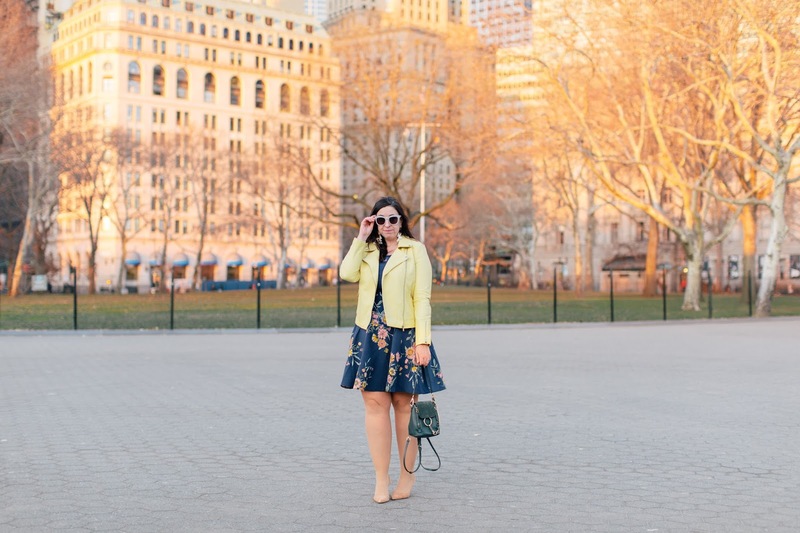 This dress is so cute and totally swooning over this yellow jacket! The jacket is such a great color, me too! I'm glad I grabbed it when I did. Old Navy is killing it lately! So many cute items. I, especially, love the dress you're wearing! Thank you so much Liz! so into old navy and their dresses right now! love that fun and bright look! Super cute outfit! I've never had much luck shopping at Old Navy, I may need to give it another go! Old Navy has the cutest clothes right now! I just bought a lavender moto jacket that I have been wearing a ton! Old Navy is killing the game this Spring! I love how fresh and fun all of their new pieces are and you just can't beat the price! Loving the mix of neutrals and really saturated colors! I’m thinking I need those olive tennis shoes! love these picks! old navy is the best! they’ve got great stuff at even greater prices! !